Coral Travel offers the best hotels and resorts in more than 30 countries - Spain, Greece, Russia, Turkey, Thailand, Tunisia, Bulgaria, Cyprus, Italy, Croatia, Montenegro, Israel, Morocco, UAE, China, India, Mauritius, Tanzania, Dominican Republic, Indonesia, Maldives, Vietnam, Seychelles, Sri Lanka, Singapore, Mexico, Cambodia, Jordan, Andorra, Austria, Azerbaijan, Belarus, Georgia, Cuba. It is constantly working to open new directions. The tour operator organizes group and individual FIT tours based on our own charter flights and scheduled flights, engaged in the development of incentive, convention, sports and other types of tourism, as well as actively selling tickets online. The company pays great attention to quality management and human resources. 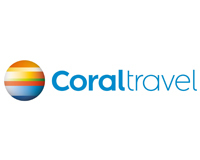 The Coral Travel brand is positioned in the Russian market as a mark of quality and reliability, which imposes a special responsibility on the Company and is an incentive for further development and improvement.